Are you looking for any reliable Crew Transport Services to transport the crew members? 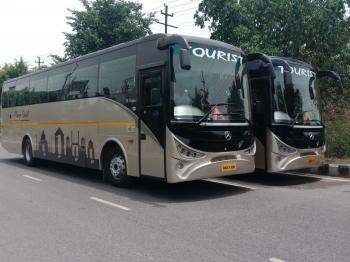 Punja Sahib Transport is Delhi based company and offers excellent Crew Transport Services. We facilitate vehicles such as fire crew transport, airline crew transport etc. We have a fleet of shuttles, mid size buses, mini buses and highway coaches with us. All our vehicles are well-maintained and have all the accessories installed. We also have many trained and experienced drivers hired with us. Our services ensure utter safety for your crew and on time reach at the destination. We also coddle the passengers with delectable beverages, meals and snacks etc.